Variohm EuroSensor explains its business model for meeting the requirements for increasingly customised, pressure, position and vibration transducers. With more than four decades of experience, Variohm EuroSensor has always supplied customised sensors but the demand has increased considerably in last few years. This reflects a more discerning customer base which constantly challenges its suppliers for cost-effective product enhancements and where value added component supply has proven to deliver many benefits for OEMs. These include simplified assembly and test for faster production times and inventory reduction. Fully tested and customised sensors supplied as plug and play assemblies can also improve final product reliability and field serviceability. Ultimately these specialised components have the potential to substantially improve the OEM´s offer to its customers with enhanced, distinctive and unique machine designs that make them stand out in their own markets. Variohm produces standard and customised products at two UK facilities where sensors for linear and rotary position, pressure, load/force, temperature, and vibration etc. may be simply adapted or significantly transformed. 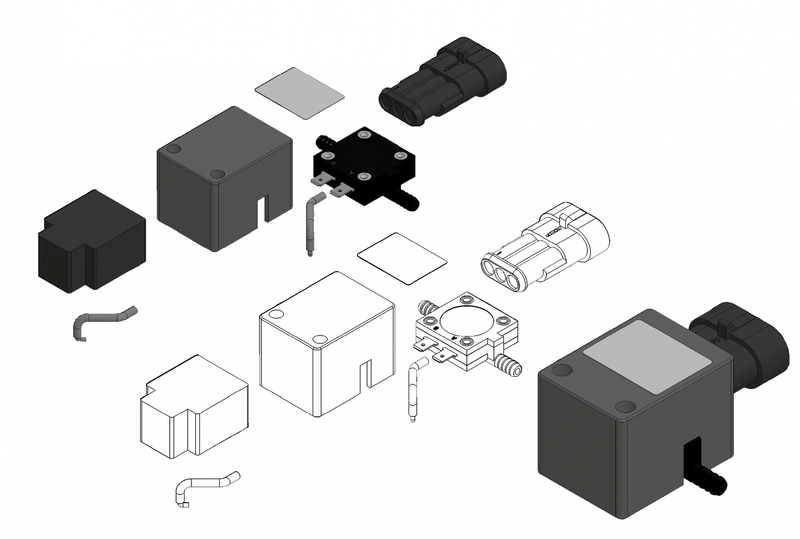 This can range from alternative electrical connection or a modified mounting arrangement to integrating sensors with significant redesigns or combining multiple sensor technologies and other electromechanical components as fully tested sub-assemblies. Mechanical modifications can include housing redesign for increased durability or perhaps integrating the sensor component into a completely new housing to simplify installation on the customer´s machine. An example of this is Variohm´s range of temperature probes, available as standard or as customised versions, which are encapsulated in metric thread-sized bolts and are ideal for critical temperature measurement on amplifier chassis or heatsinks. Temperature probes also take the form of ring terminals or are embedded into brass or thermoplastic tubes to aid installation. In this way the customer can overcome the potential problems of handling and installing tiny NTC or PT type temperature sensors. This type of housing redesign has also been successfully applied to pressure measurement where a relatively delicate standard pressure switch from one of Variohm´s distribution partners was fully encapsulated and potted into a robust thermoplastic housing – complete with electrical and hose connectors. Used on heavy duty agricultural machinery, the new assembly overcomes the need for the customer to design and fit a protective cover, has reduced installation costs and has substantially increased reliability and machine availability. Electrical and electronic modifications cover leadwires and termination/connectors on one level but can also include ´tuning´ the electrical output or input signals to specific customer requirements. This type of modification can ensure that the customer´s installation effort is reduced, saving time and cost with relatively small component purchase increase for an overall installed COG reduction. Variohm´s customised sensor service also benefits customers through its close links with other members of the Variohm Group; namely Heason Technology for motion control components and systems, Herga Technology for switching and sensing solutions, and Ixthus Instrumentation for specialist measurement systems. The Variohm Group shares its customer base for specialist service and bespoke solutions and all are members of the LSE listed discoverIE Group plc (LSE: DSCV) – an international group of businesses that designs, manufactures and supplies innovative components for electronic applications.